Image caption Dr Rowan Williams says the Big Society idea is viewed with "widespread suspicion"
The Archbishop of Canterbury has warned that the government is committing Britain to "radical, long-term policies for which no-one voted". Writing in the New Statesman magazine, Dr Rowan Williams raised concerns about the coalition's health, education and welfare reforms. He said there was "indignation" due to a lack of "proper public argument". A Downing Street spokesman said: "This government was elected to tackle Britain's deep-rooted problems." "Its clear policies on health, welfare and the economy are necessary to ensure we are on the right track," he added. The article was written for the latest edition of the New Statesman, which Dr Williams guest edited. The magazine is on sale from Thursday and the article is also available on its website. In the piece, Dr Williams said the Big Society idea was viewed with "widespread suspicion". Talking specifically about the government's key health and education policies, he said they were being introduced at a "remarkable speed". "At the very least, there is an understandable anxiety about what democracy means in such a context," he said. In a wide-ranging attack, he accused the Conservative-Liberal Democrat coalition of creating "anxiety and anger" in the country by introducing reforms without sufficient debate. Dr Williams was critical of Prime Minister David Cameron's flagship Big Society initiative, which aims to shrink the state and hand more control of services to volunteer groups, describing it as a "stale" slogan, viewed as an "opportunistic" cover for spending cuts. The archbishop's article also said there was concern that the government would abandon its responsibility for tackling child poverty, illiteracy and poor access to the best schools. Media captionBusiness Secretary Vince Cable, "We welcome debate with him, it's not a problem"
"Government badly needs to hear just how much plain fear there is around questions such as these at present," he said. He also criticised the government's welfare reforms, complaining of a "quiet resurgence of the seductive language of 'deserving' and 'undeserving' poor" and the steady pressure to increase "what look like punitive responses to alleged abuses of the system". Business Secretary Vince Cable said the government had a clear mandate for its work. The tone and strength of language used in Dr Williams' attack on the coalition has taken ministers by surprise. Accusing the government of being committed to "radical, long-term policies for which no-one voted" is an overtly political statement and one Downing Street has quickly rebuffed. But they can't ignore the broad sweep of criticism or questioning of their mandate to govern. The timing of this attack is curious as he has criticised coalition policies before. It may have something to do with the fact he was guest editing left-wing magazine The New Statesman and wanted to write a thought-provoking piece. I've heard he wanted to interview the prime minister but Mr Cameron must have declined. Dr Williams also has form when it comes to entering the political arena. Ministers say they are happy to debate policies with him but clearly feel he has overstepped the mark with the scope of his article. "The two parties of the coalition got substantially more than half of the total vote at the last election and the public knew that we were going to have to embark on very difficult changes connected with sorting out the massive budget deficit problems, so I don't think that criticism has much weight," he said. Defence Secretary Dr Liam Fox had the government had legitimacy because it had a majority in the House of Commons. "We should be relaxed about this. 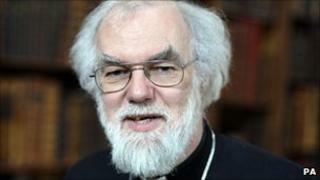 We shouldn't be hot under the collar because one churchman or another has expressed his views," he told Sky News. A Downing Street spokesman said the prime minister had supported the idea of a Big Society long before the financial crisis and the need for significant savings. Pressed over the significance of Dr Williams' comments, the Downing Street spokesman said: "He's obviously an important figure in British society." Labour said the archbishop's comments reflected the concerns of people across the UK. Shadow education secretary Andy Burnham said: "This government has no mandate for cutting too far and too fast, subjecting the NHS to a reckless top-down reorganisation and launching an unprecedented attack on young people by scrapping EMA and trebling tuition fees." The former Prime Minister, Tony Blair, said there was a long-standing tradition of archbishops criticising government. "Obviously people used to criticise our policies not just on Iraq and foreign policy but on domestic policy and reform as well. It's just part of the way things work," he said.